Would you believe, I have never had one? I have sung this song so many times. 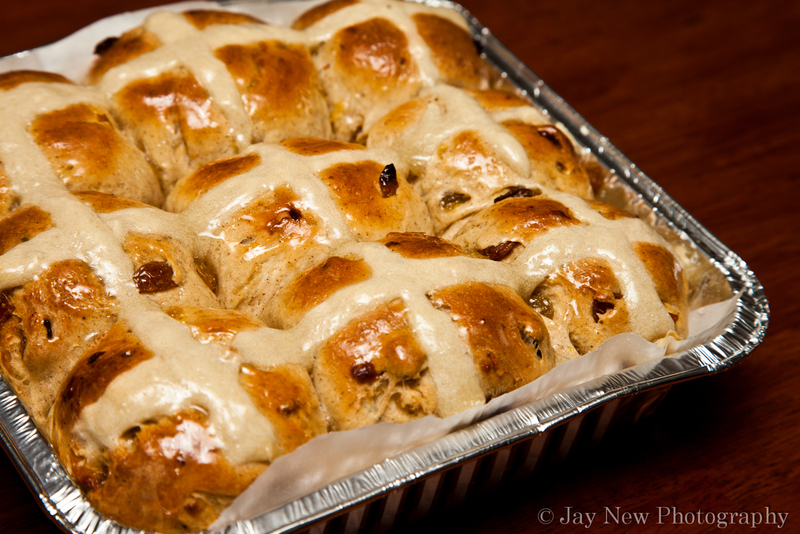 Every time Easter comes along, I see this buns sold in stores and bakeries. Never, have I purchased one. I have no idea why. This year, I sought to change that. 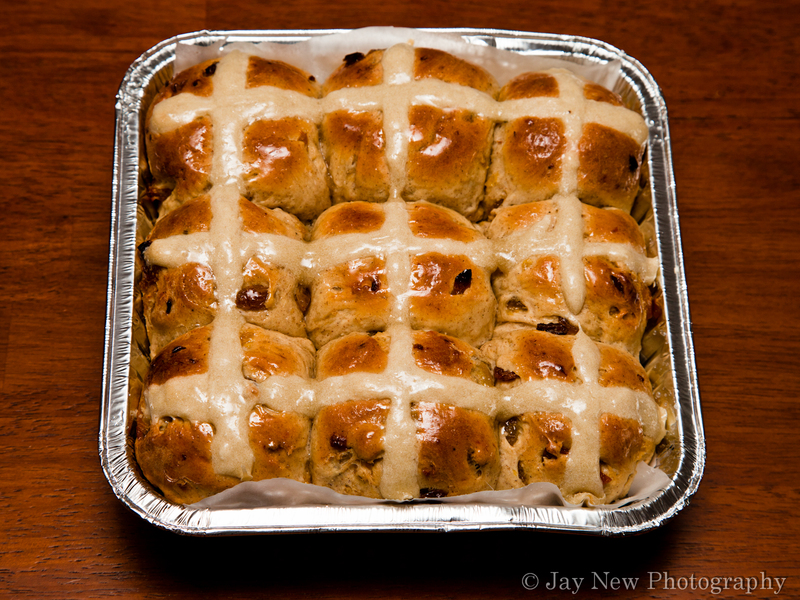 A hot cross bun is a sweet, yeasted and spiced bun that is made with currants or raisins. It’s most prominent feature is a “cross” marked on top. It is traditionally eating at Easter. Some historians believe that these buns pre-date Christianity, but the term “hot cross bun” was not recorded until 1733. It is believe that the Saxons ate these treats, in honor of the Goddess Eostre (the cross is thought to symbolize the four quarters of the moon.) Eostre, it is thought, is the probable origin for Easter. There are many superstitions surrounding Hot Crossed buns. My personal favorite and why I decided to wake early in the morning, to make these hot and fresh, is that sharing hot cross buns with another, is supposed to ensure friendship, throughout the coming year. Especially if “Half for you and half for me, Between us two shall goodwill be.” Today, I made a large batch so that half of the buns can be shared with our good friends and their daughter (our Goddaughter). They are very important people in our lives and are true friends and I wanted to share the joy of Easter and the sharing of Hot Cross Buns, with them. In a microwave safe bowl, combine milk with butter slices and heat for 1 minute. Allow milk/butter mixture to cool to warm. Combine all ingredients for buns and knead until dough is smooth and elastic. Place dough in a greased bowl and turn dough over (so all sides are covered in oil). Cover and let it rise for 1 hour. Allow dough to rest, covered for an additional hour. Combine ingredients for the crosses to make a paste and place it in a piping bag (or plastic bag with corner cut off). Form a straight line of Cross paste, starting on one edge and piping a straight line to the other edge of the pan. Repeat this the opposite direction until you have a vertical and a horizontal line forming crosses. Bake buns at 400 F for 25-35 minutes. During the last 5 minutes of baking, in a small sauce pot, combine ingredients for glaze and heat until all the sugar is dissolved and the glaze thickens. When buns are removed from the oven, glaze the tops of the buns. Allow the buns to cool and enjoy! One ha'penny, two ha'penny Hot Cross Buns! i didnt know that part about splitting your hot cross buns with someone. Had i known that, i would make lots and lots and lots of them and share them with the world. LOL. your buns are gorgeous! LOL I can just see it, next Easter: Crustabake’s blog will write about how she inundated her country with Hot Crust Buns!!! Happy Easter and thank you very much. Never made those my self as its dominant here in Supermarkets during this Easter season, I guess that must smell really nice once freshly baked. I see these only around Easter time, where I live. The smell of the cinnamon and raisins baking with fresh bread was amazing. It is a great start to Easter morning. Happy Easter to you too! Same to you 🙂 Thank you very much!!! They look fantastic! Have a happy Easter. Thanks! Happy Easter to you as well! I had one when I went to London. Yum! Yours look exactly the same and even better! 🙂 Thank you, Sohana 🙂 I wish you were here, I would give you some too!